Why be satisfied with the status quo, when you can experience supernatural transformation?Have you ever wondered how to break past faulty thought patterns, traumatic experiences, social norms, deceptive traditions, and false religious beliefs that hold individuals captive, hindering accomplishment of Gods kingdom mandate? 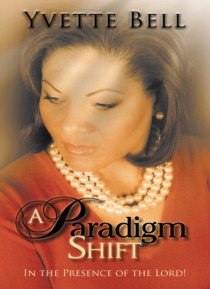 Then, A Paradigm Shift, In the Presence of the Lord, is a great ministry res… ource to assist you in your quest. Because life can produce situations which manifest feelings of rejection, fear, anxiety, inferiority, and intimidation individuals may eventually back away from the will of God for their lives. In order to be fully healed and break free from such limitations, in this manuscript, you will discover:1. How to be divinely aligned with the basic principles of Gods covenant,2. How to be healed from the toxins formed in the mind, which eventually erect fortified walls around the heart,3. How to recognize heavenly weapons assigned to every believer that will destroy satanic hindrances,4. How to identify change agents and mid-wives divinely assigned to assist with impartation and the birthing of spiritual gifts. This is the greatest hour of the kingdom of God. Heaven is literally opening up and pouring out Gods treasures upon the earth realm. For the believer, who is in divine alignment with God, the works of Christ will begin to manifest greater through the vessel, causing paradigm shifts in every facet of their lives. - Yvette BellThis is your season to step into the fullness of your divine destiny and obtain all that God has for you. Why be satisfied with the status quo, when you can experience supernatural transformation and victory during the Paradigm Shift!